The Taxi Firm - East Midlands Airport Transfer Specialists. The Taxi Firm makes travelling to East Midlands Airport stress-free, whether it is for business or your family holidays we can get you there. As we specialise in East Midlands Airport transfers we consider ourselves to be the number one airport taxi company in Peterborough. East Midlands Airport is 63.7 miles (approx) from Peterborough, therefore the travel time would be 1 hour 30 min in moderate traffic. East Midlands Airport (IATA: EMA, ICAO: EGNX) is an international airport in the East Midlands of England, close to Castle Donington, Leicestershire. East Midlands Airport has established itself as a hub for low-fare airlines such as Jet2.com and Ryanair and tour operators like TUI Airways which serve a range of domestic and European short-haul destinations. It is also a base for BMI Regional, Flybe, and Thomas Cook Airlines. Passenger numbers peaked in 2008 at 5.6 million, but had declined to around 4.5 million in 2015, making it the 11th busiest airport in the UK by passenger traffic. A major air cargo hub, it was the second busiest UK airport for freight traffic in 2016 after London Heathrow. 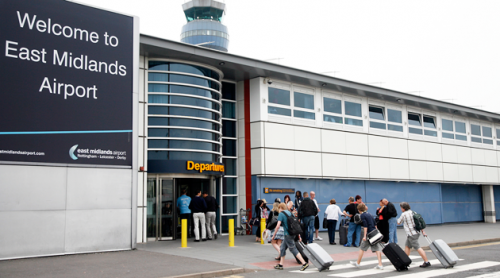 The airport is owned by the Manchester Airports Group (MAG), the largest British-owned airport operator, which is controlled by Manchester City Council, retaining the controlling stake. From monitoring flights to checking for delays on motorways. We are working in the background to make sure you are transported to your destination with the minimum of stress. We are entrusted with hundreds of airport transfers and we use all the tools in our arsenal to get you there on time. So book your journey online or drop us call us on 01733 305405.